Welcome to Music Friday when we bring you fun songs with jewelry, gemstones or precious metals in the title or lyrics. 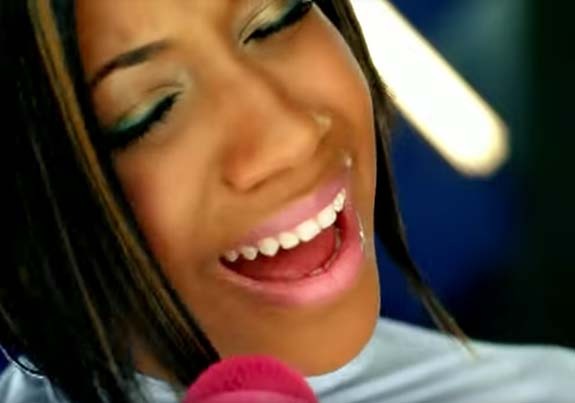 Today, a 14-year-old Tiffany Evans sings about a very special piece of jewelry in her 2007 debut single, "Promise Ring." In the song, the former Star Search Grand Champion in the Junior Singer Division tells her boyfriend that sometimes a girl needs a token of love to show how much she's appreciated for all the things she does. Apparently, her boyfriend was thinking the same thing. He surprises her with a small velvet box containing a promise ring and makes the following vow: "I promise not to hurt you, I promise not to lie / I promise to befriend you and defend you with my life / I promise you forever, I promise you today, he said / Would you wear my promise ring? I said yes." Later in the song, Evans sings, "How in the world could a girl say no / I knew it the moment he made my finger glow." The recurring hook is, "Yes, I'll rock your promise ring." "Promise Ring" was the lead single from the teenager's self-titled debut album. The song went to #1 on the U.S. Billboard Bubbling Under Hot 100 list and #66 on the U.S. Billboard Hot R&B/Hip-Hop Songs list. The album scored a Top 20 position on the U.S. Billboard Top R&B/Hip Hop albums chart. The official video for the song spotlights the teenybopper rockin' her promise ring with a special appearance by Grammy Award-winner Ciara, who was 21 years old at the time. The video has been viewed on YouTube more than 12 million times. Born in the Bronx, N.Y., Evans rose to fame in 2003 as an 11-year-old contestant on Star Search, hosted by Arsenio Hall. Evans was the only performer in the talent show's history to earn perfect scores on all of her appearances. The Grand Champion in the Junior Singer Division soon caught the attention of Columbia Records, which signed her to a record deal. Written by Michael Crooms, Ezekiel Lewis, Balewa Muhammad, Candice Nelson, Bryan Reid and Patrick Smith. Performed by Tiffany Evans, featuring Ciara. A series of groundbreaking discoveries have the science community singing the praises of diamonds — especially the ones with inclusions. One physicist compared the precious gemstone, which can ferry material to the surface from hundreds of miles beneath the Earth's crust, to a "tiny indestructible spaceship." A few weeks ago, we reported on a never-before-seen deep-Earth mineral — calcium silicate perovskite — that had traveled to the surface trapped within a diamond. The unstable material would have normally deformed as it moved to the surface, but within the body of diamond, it remained intact. Then we learned about the discovery of ice-VII, a type of water ice that forms under enormous pressure. Previously, scientists theorized that ice-VII likely existed in great abundance in our solar system, but they did not think it could naturally occur on Earth. That thinking was turned upside down when traces of the unique crystallized water was found encapsulated in a diamond. Both the calcium silicate perovskite and ice-VII originated 400 miles deep within the Earth's crust and rode to the surface in volcanic eruptions as diamond inclusions. Neither could have survived the massive pressure change outside the protection of the diamond. As diamonds form hundreds of miles beneath the Earth's crust, tiny bits of their surrounding environment can be trapped inside. What's particularly unique about diamonds is that the inclusions will remain under the same pressure as they were during the time they were encapsulated. "The diamond lattice doesn't relax much, so the volume of the inclusion remains almost constant whether it's in the Earth's mantle or in your hand," noted Oliver Tschauner, a professor of geoscience at the University of Nevada, Las Vegas. A press release provided by the university explained that in the jewelry business, diamonds with impurities hold less value. But for Tschauner and other scientists, those impurities have infinite value, as they may hold the key to understanding the inner workings of our planet. In the most recent case, they revealed that aqueous fluids reside deeper in Earth than anyone ever expected. The once-elusive ice-VII has 1.5 times the density of Ice-I, which is the type of ice we might put in a soft drink. Ice will progress from ice-I to ice-II, and so on, based on differing pressure and temperature conditions. "These discoveries are important in understanding that water-rich regions in the Earth's interior can play a role in the global water budget and the movement of heat-generating radioactive elements," Tschauner said. "It's another piece of the puzzle in understanding how our planet works." The ice-VII findings by Tschauner and his team at the University of Nevada were published in the journal Science. The findings related to the discovery of calcium silicate perovskite by scientists at the University of Alberta were published in the journal Nature. 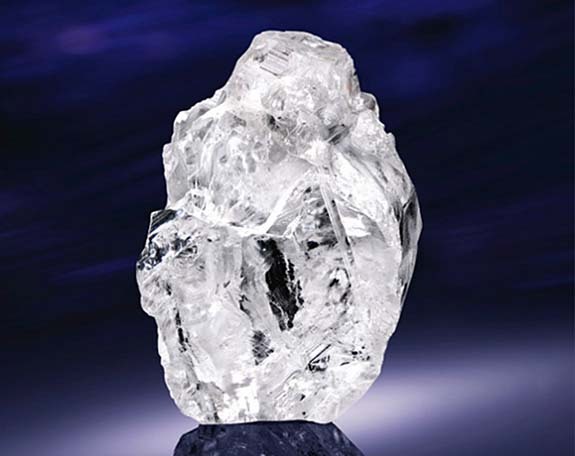 Credit: Image of 1,109-carat Lesedi La Rona courtesy of Sotheby’s. The Houston Astros' 2017 World Series rings tell the story of the franchise's first-ever championship using 225 colorless diamonds, nine orange sapphires and 16 blue sapphires set in 14-karat white and yellow gold. Each ring weighs 90 grams and glitters with 10.40 carats of genuine gemstones. Players, coaches and team management received their new bling during a special ceremony at Minute Maid Park last week. According to the team, the top of the championship ring illustrates how — when the pieces come together — history can be made. The colorful design features the team's iconic "H" logo rendered in colorless diamonds layered over a yellow-gold-framed Texas star formed from orange sapphires. The star sits atop a circle of blue sapphires — also framed in yellow gold — which is encircled by a halo of tiny white diamonds. The "H" posed a tricky design challenge for Minneapolis-based Jostens. The solution was to use 11 custom-cut baguette diamonds, which, not coincidentally, were the number of the team's post-season wins. Another challenge was sourcing orange sapphires of a hue that exactly matched the team colors. According to published reports, Jostens and Astros' team management had to go back and forth a number of times before getting it exactly right. The logo's diamond halo includes 56 round diamonds, which represents the 56 years of Astros franchise history prior to earning a world championship. In all, the total diamond count for the top of the ring amounts to 112, the number of wins — both during the regular season and post season — that the Astros achieved to win the World Series. On one side of the ring is the player's name rendered in raised yellow-gold lettering. Below the name is the the iconic Houston skyline, paying the ultimate respect to the city and fans who never wavered in their support for their team. A rendering of Minute Maid Park's left field wall seems to lift up the city of Houston, a sentiment expressed by many fans when describing what this championship has meant to them and their community in light of the devastating flooding that hit the city in August of 2017. Layered over the wall is the player's number encrusted in white diamonds. "Our guys were playing for something bigger than themselves," team president Reid Ryan said. 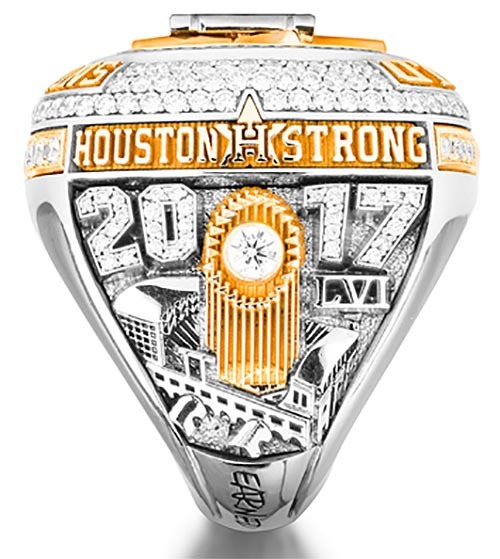 On the opposite side of the ring, the phrase "Houston Strong" is prominently displayed in contrasting yellow gold atop the year, which is rendered in diamonds. A single solitaire diamond sits in the top of the Commissioner's Trophy, representing the first World Series victory in franchise history. The trophy seems to be rising from the center of Minute Maid Park. The Roman numeral LVI sits to the right of the trophy, paying tribute to the 56-year history of the Astros franchise. The open sides of the ring feature a rim of round colorless diamonds set in contrasting yellow gold and punctuated by two princess-cut sapphires, an orange stone on one side and a blue stone on the other. Each is set in a bezel that's shaped like a home plate. These sapphires represent Houston's unique achievement of being the first franchise in history to have won a pennant in both the American and National Leagues. 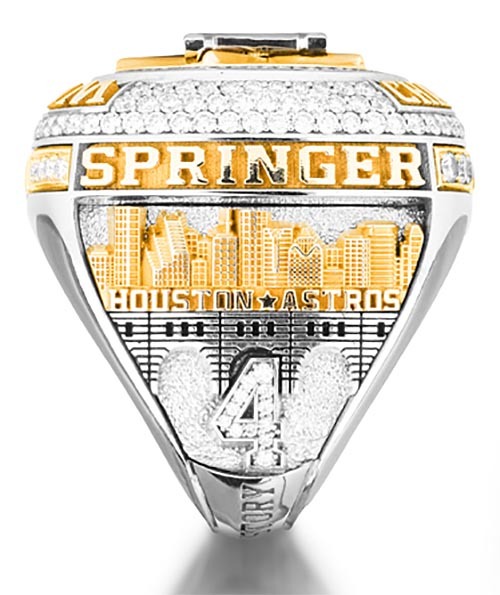 The interior of the ring showcases the results of each series in the Astros' playoff journey, including the logos of the Boston Red Sox, New York Yankees and Los Angeles Dodgers. 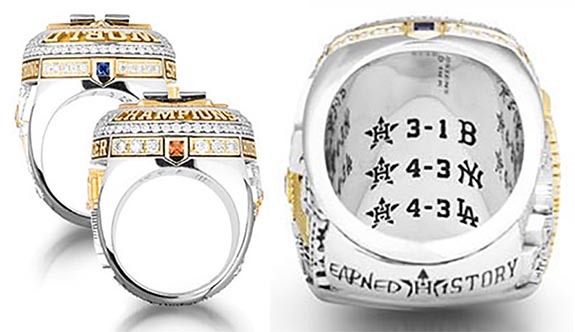 The bottom edge is inscribed with the organization's rallying cry, "Earned History," and includes the Astros' logo rendered in black enamel on 14-karat white gold. 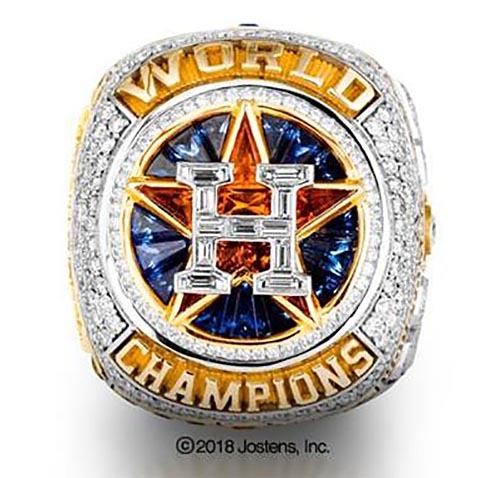 Jostens reported that the Astros ordered 1,322 championship rings, which were distributed to the team's players, coaches, clubhouse and training staff, baseball and business front office members, medical staff, part-time associates, Hall of Famers, owners and broadcasters. The only team to order more were the 2016 champion Chicago Cubs. That team ordered 1,908 rings, a nod to the prior time the Cubs won the World Series — 1908. Credits: Images via Twitter.com/Houston Astros; Courtesy of Jostens.